DESPITE WHAT A UNION ORGANIZER MAY TELL YOU, THERE IS NO OTHER PURPOSE OF A UNION AUTHORIZATION CARD EXCEPT TO UNIONIZE YOU. 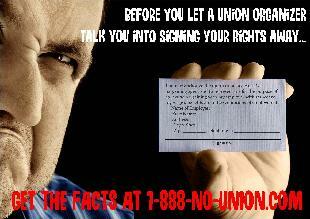 If 50% +1 of you and your co-workers sign a union's authorization cards, you can be unionized without an election. If EFCA is signed into law, you will effectively lose your right to vote in a secret-ballot election. To read more about union authorization cards and see examples of union authorization cards, go here. "Sign a card because everyone else is..." This union tactic makes you think that all your co-workers may be signing cards when, in fact, the union organizer may only have one or two other signatures. "Sign a card to get information..." This union tactic is a trick. The union organizer is manipulating you and your co-workers into thinking that you'll be put on some mailing list when, in fact, the union will use your signature toward unionizing you without an election. "Sign a card if you're interested in learning more about the union..." Like the above example, this tactic is also a union trick to use your signature to unionize you. "Sign a card if you don't want to pay an initiation fee..." While this tactic may be unlawful, it is commonly used to intice employees into thinking that, by signing union authorization cards, they will save money that they may be forced to pay later on (in Non-Right-to-Work states). "Sign a card because, if you don't, you'll get fired when the union comes in..." Like the above example, this too may be unlawful coercion on the part of the union or its agents. "Sign a card in order for the union to get you more money..." Union organizers are leagally allowed to make promises they cannot keep. However, if you fall for the union's promises and the union later breaks its promises to you, there is very little you will be able to do about it. For more on union promises, go here. If you are invited to a union meeting and asked to sign in (whether at the door or during the meeting), your signature can be used by the union as a "showing of interest" in its effort to unionize you.